Beachgoers in California have been treated to the unusual sight of two goats surfing the waves. Goatee, the nanny goat, and her kid Pismo stood on surfboards and glided along the water at San Onofre State Beach in Orange County. Their owner, Dana McGregor, initially got Goatee in to eat unwanted foliage on his property but soon started taking her out on his surfing trips. When baby Pismo was born in March, he started putting him on the board too. 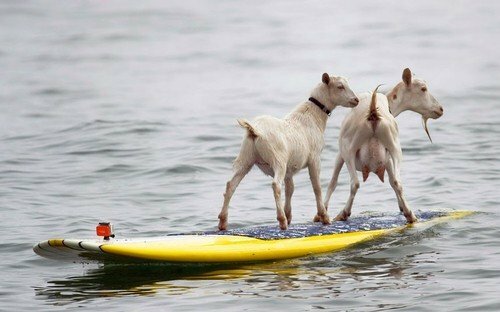 On Wednesday, he teamed up with local surfers Mark and Debbie Gale to try to get both goats to ride on one surfboard together. They managed to stay upright for a few waves, by which time Goatee had had enough and swam to shore. Pismo kept his balance and “seemed a natural” on the board, reporters said. “They did a pretty good job. They caught the first wave and it was pretty good,” said Dana McGregor.